It may not seem like it this morning, but warmer days are just ahead! Enjoy them while you can. The turn to a south wind and milder conditions begins tomorrow. Sixties are in the bag for Friday and through the weekend and into early next week. A rouge seventy or two could be lurking in the mix as well! Large temperature swings, as always, are dictated by changes in the jet stream flow. Generally, when the flow dips over the western U.S. while rising over us, we experience warmer conditions. The question is will the dip in the jet result in an eventual storm for us? The latest computer model guidance suggests the pattern will shift dramatically toward Thanksgiving, with much colder air replacing the warm. Depending on the nature of smaller disturbances in the flow, a cold front may simply advance through or may stall and develop “waves” or bumps of disturbed weather, some of these can occasionally go on to produce deep storms. The latest computer models keep hinting at waviness in the arctic front sometime around Wednesday and Thursday, followed by a substantial drop in temperature. 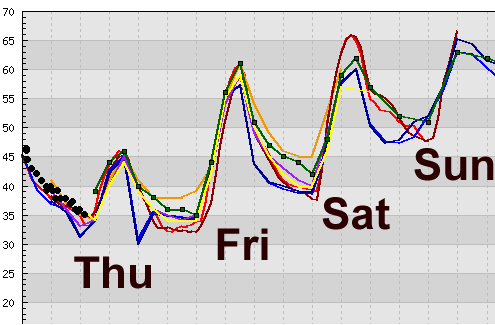 Lows could dip below twenty by Black Friday morning! Since the models have been doing some waffling regarding the timing and position of the frontal waves, I still can’t determine whether winter precipitation of any consequence is possible on Wednesday or Thursday. As always, I will have the latest look at the situation on KOLR/KSFX tonight.